So then, how can we back up the words that we will go out into the world and share the gospel with action? 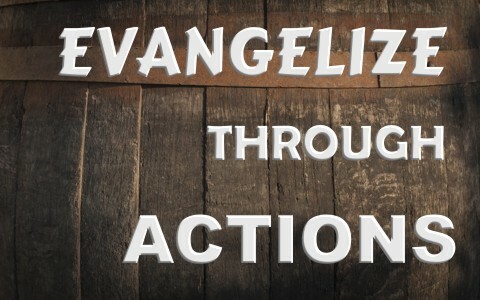 Here are 5 ways to evangelize through our actions. In the context of this verse we see that Paul met people where they were. He says in verses 21 and 22 that he became as them (Jews and non Jews). He understood that the best way to get the message across was to understand the customs and speak to them through their own ways. Paul was raised a Jew but needed to learn the practices of the Gentiles since they were his major audience. What we can learn from this is that we should not hit the baby Christian with a fire and brimstone gospel when we are evangelizing one-on-one. Instead we should put it into words that they understand and practice deference to their ways. Our job is to present the gospel, not to change them into something different. Leave that to the Holy Spirit. The idea of “rolling up your sleeves” is often said of a good manager. He rolls up his sleeves when he sees a need. For example, if the tables at the restaurant need bussed, he gets in there and does it when he sees that his staff is busy doing other things. In the same way when it is time to share the gospel and you see an opportunity, take it. Don’t wait for someone else to do what you can do yourself. When my children were little they were learning the importance of sharing Jesus with people they meet. We were in a public place and I saw a man who reminded me of my Daddy. I noticed he was wearing a WWII cap and that gave me some common ground to share. I ask where he served in the war and he shared his story. This meeting between us and the WWII veteran happened not long after the terrorist attack on the USA that we now call 911. I shared that my Dad was also in the war and spoke a little of the things that I knew of his service. I then asked this kind man if what was happening in today’s world bothered him at all. He shared that he was frightened and even mentioned a possible WWIII. I then asked if he were to die today if he knew for sure that he would go to heaven. That was my in – I found a common ground and looked for opportunity. From there one of my daughters walked this lovely man through John 3:16 explaining the verse step by step. This man did not claim Jesus as his Savior that day but we were confident that because I rolled up my sleeves and found common ground that this man heard the clear gospel. In this incident my actions spoke to my children and they jumped right in. Don’t waste time, do it when you have opportunity. One of the best ways to evangelize through action is to give to those that have need. Many times you will see a homeless person on the street holding up a sign that says “hungry, need food”. Generally they are situated on a street corner and they will approach cars asking for money. I am not saying don’t give them money, however if they are truly hungry why not give them food? I find myself going through a nearby drive-thru to get some food for that hungry person often. In the process of feeding their flesh I also let them know that God loves them and I share the gospel with them so that I can feed their spirit too. Your act of kindness will open the heart of the hungry and may even give them a personal Savior. Old age is a gift from God. However there are many elderly people in your own community that may not think old age to be a gift at all. They may be shut into their home and unable to get out and visit folks. Or they may be in an extended care facility where nearly no one ever comes to visit them. Their unending loneliness clouds the blessing. What better way to share the gospel than to visit the elderly. They love to see people. They love to sing songs and most of them even have many, many great hymns of faith memorized in their hearts. Go a step further and take young people to see and sing to the elderly, you will see a joy on their adoptive grandma and grandpa’s faces like no other. Singing the great hymns of faith and even some of today’s contemporary songs will share the gospel in a very special way. Music is a powerful way of acting out your evangelism. Bring in an elderly neighbors mail (include a little inspirational book or even a small Bible with the mail). Your actions do speak louder than words and you can back up your words about Jesus in these five simple ways. Meet them where they are, don’t be afraid to get down to their level and share the gospel in simple words that they understand. Don’t wait for someone else to take the lead, roll up your sleeves and take the lead, then let someone else drive it home. When you see someone is hungry, give them food for their body and spirit. Sing with the elderly and brighten their day by inviting the young people to sing with you. Finally, do random acts of kindness, but don’t stop there. Be sure to include the gospel message with the acts of kindness. Evangelizing through your own actions is possible and very powerful.